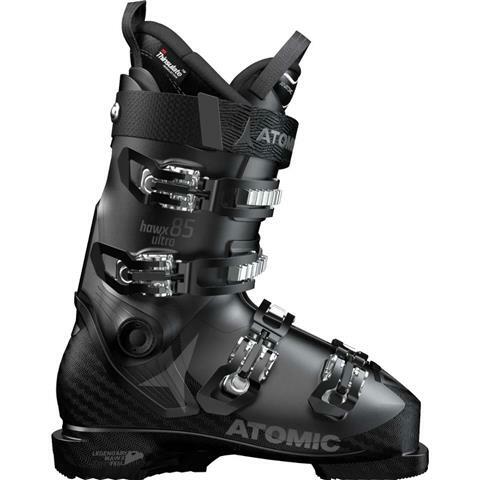 The Hawx Ultra 85 Womens Boot from Atomic is an excellent ski boot for the intermediate to advanced level skier who has a narrow forefoot and narrow shaft of the leg. Atomic's new Prolite Technology is a new way that they produce boots to be very lightweight without any sacrifice to power. Prolite starts by adding lightweight materials and only beefing up the strength of the shell in strategic areas. The Energy Backbone drives more power and rebound to each turn you make. The Memory Fit 3D Silver Liner has heat moldable properties to fit you perfectly and 3M Thinsulate Insulation to add extra warmth. Atomic's Memory Fit Shell can be heated and molded by an Authorized Atomic Dealer in less than an hour for a true custom fit. A Women's Specific Cuff keeps you calf muscle secure and comfortable all day on the mountain. The True Flex Construction uses plastic that keeps a consistent flex no matter what the temperature on the mountain is. Cons: not stiff enough for more advanced skiier try 95s!